Seventeen-year-old Danny Wright joined the Idaho National Guard because he wanted to serve his nation and honor his father’s memory. When riots break out in Boise following a government shut-down due to controversy over a piece of federal legislature, Danny’s unit is called in to help control the crowds. One accidental shot—fired by Danny—changes Danny’s life, and the lives of everyone in the United States forever. Divided We Fall is a tense, emotionally-charged book. Reedy creates an excellent balance between a peaceful, normal rural life and a turbulent political landscape that quickly escalates out of control as Danny struggles to face the consequences of his actions and must make impossible decisions regarding his loyalty. Reedy’s inventive use of social media updates, news headlines, blog discussions, and iPad-like technology throughout the story does a great job at grounding this near-future story in the present, making the events of the novel all the more plausible and all the more frightening. While Divided We Fall is not without humor or its moments of levity, the slow burn of an untenable political situation simmers under the surface until it can no longer be ignored, resulting in an explosive ending. This novel explores the values of democracy, freedom, and equality in a very real, and very frightening manner. Cover Comments: This is a very eye-catching cover. Wow. I really like how active it is, and how the title is bold, but doesn't get in the way of the image. The grey sky is also very foreboding. I think that this is one book that a lot of people will pick up for the cover along. Divided We Fall is out next Tuesday! Gorgeous cover. The premise sounds very compelling. 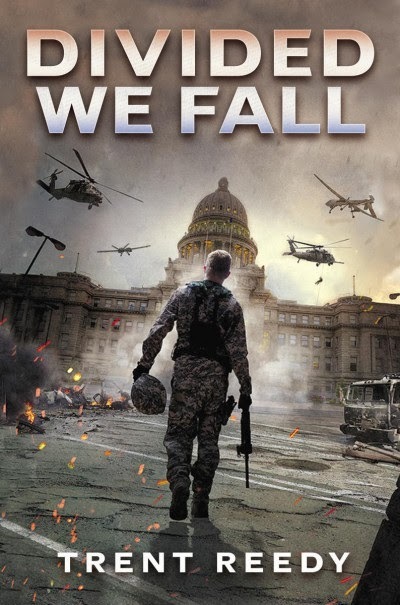 I just finished Divided We Fall-I really enjoyed it and will be waiting anxiously for the second book in the series. One of the best books I have read lately. This book may be classed as a young adult book but I am a mature adult and I loved it. I highly recommend the book.